3-2-1 Blast Off! 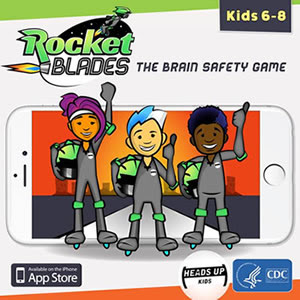 CDC’s Injury Center has developed a mobile game app on concussion safety for children aged 6 to 8. Through a futuristic world of galactic racing adventures, children can learn the benefits of playing it safe and smart! Hitting your head can cause a brain injury, called a concussion. You should tell your coach, parent, or another adult if you hit your head. You should see a doctor if your brain is hurt, and rest before returning to play. Download CDC HEADS UP Rocket Blades at no cost. Join the Thunderclap on June 21st, 2017 to promote concussion safety among kids. Sign up here to participate. Get answers to questions on your mind during the CDC HEADS UP “Ask the Expert” Facebook event tomorrow, June 13th! Download a handout you can share with your kids and get tips on talking about concussion safety. Watch this video to learn more about HEADS UP Rocket Blades. This entry was posted in Concussion. Bookmark the permalink.